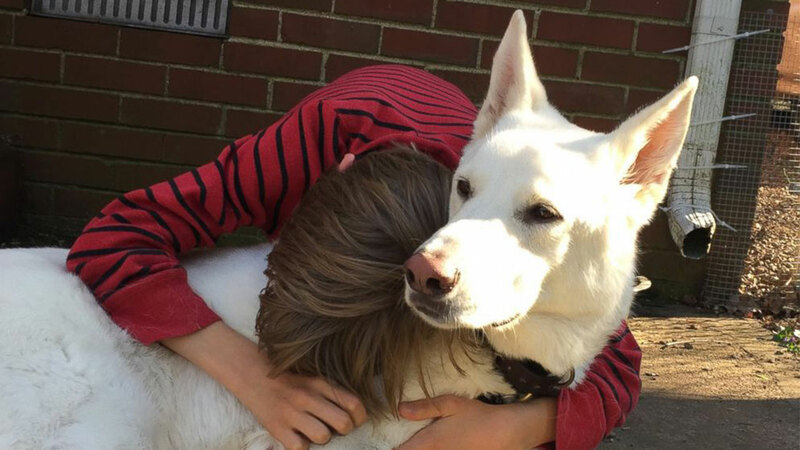 NASHVILLE, Tennessee -- This boy's tearful reunion with his best dog friend is guaranteed to melt your heart. Eleven-year-old Lennox Goebel of Nashville, Tennessee, cried tears of joy when he saw his neighbor's dog, Bogart, for the first time in a year. Bogart had been away in California while his musician owner was on tour. Young Lennox had a tough time dealing with the separation, said Lennox's mom, Ellen Goebel. "I have known the emotional drama that he had felt while Bogart was away," Ellen Goebel told ABC News. "It was so sad when Bogart's owner told us she was going on tour, so she had to fly him to California to stay with her mom." The family wasn't sure how long Lennox and Bogart would be apart. "She had said he would be gone until last July, and he left last April, so we thought he'd only be gone a couple months and my son was already crying," Goebel said. "The day they were going to fly we went over there super early so he could play with the dog before they got on the plane." The Goebels have a dog of their own, a Bichon Frise-Shih Tzu mix named Happy. Lennox loves happy, but says Bogart is his "best friend." Ellen Goebel posted the tearful reunion to Facebook, where it gained over 250,000 views. Lennox knew his neighbor had a surprise for him but had no idea his beloved friend was home for good. "I had no idea. I just immediately thought, 'I need to pet him,'" Lennox told ABC News. "It felt like spring break all over again." Lenox's mom says he was "over the moon" to have his best friend back.